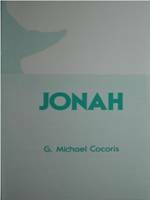 Jonah is a 74 page expositional and homiletical treatment of Jonah. It includes an expositions of the literary units of the book and a chapter on "Jonah's Fish: Fact or Fiction," as well as, a chapter that summarizes the book. Jonah is available for $5.00, plus shipping and handling. While PayPal is the payment processor, you do not need a PayPal account to make your payment. PayPal accepts payments from all Visa, Mastercard, Discover and American Express cards, as well as some other localized payment types.